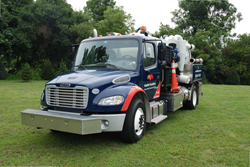 Master Locators, Inc. today announced that it has added a Vactor* HXX Paradigm* compact vacuum excavator to its growing fleet of subsurface utility engineering (SUE) equipment, tools and vehicles. The HXX Paradigm is ideally suited for SUE involved in civil, road, municipal, commercial, industrial and residential projects. Chosen for its many benefits, the Paradigm is minimally invasive reducing project reconstruction costs and damage to surrounding areas. Master Locators, Inc. is a leading company in the subsurface utility engineering (SUE) field serving contractors, designers, engineers and project owners from concept to design and on through to construction. At Master Locators, we are a passionate, fully integrated team – from highly qualified, expert field technicians and project coordinators to talented engineers and customer service representatives – who thrive on providing consistent, unmatched state-of-the-art utility locating and excavating services. Master Locators also provides educational programs designed to enable customers’ complete understanding of SUE technologies. Visit http://www.masterlocators.com to learn more. *Vactor and Paradigm are registered trademarks of Vactor Manufacturing, Inc.